... ouuups ... that sounds complicated again - don´t worry just follow the tour ! SECRETION of tear components by the glands. Failure/ LACK of basic functions means: onset of pathology ! and thus lead to disease progression and worsening of the condition. Sequences of Secondary Pathogenetic Factors govern the primary pathology of Tear Film Deficiency - and interact with each other. The secondary pathology terminates in Chronic Mechanical Irritation by Friction and Hyper-Osmolarity as the main factors that induce Damage of the Surface Tissue. This very schematical diagram is supposed to indicate that the Different Types of Tear Film Deficiency that determine the Type of Dry Eye Disease tend to mix with increasing severity of disease. This is conceivably due to the impairment of more and more functional complexes with downstream negative effects as the disease process proceeds, destroys for tissues and becomes more severe. It is difficult to allocate such secondary pathology to specific types of tear film deficiency. 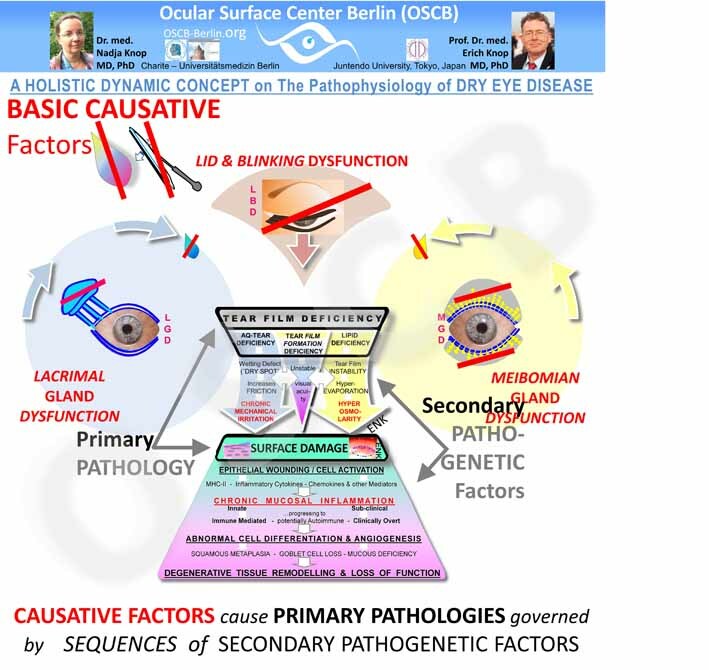 In fact, the factors in secondary pathology are interacting - which is indicated in the Dry Eye concept by horizontal white arrows linking the different types of tear film deficiency. Since secondary pathogenetic factors interact anyway, it is probably not too surprising that it is difficult to clearly allocate them. There is also some indication, reported by BRON and LEMP, to think that different types of Dry Eye Disease may only be clearly discernable in initial phases of Dry Eye. Whereas during the progression of Dry Eye Disease of the typically chronic disease process the individual disease types tend to mix progressively as the disease progresses and affects more functional circuits with accumulating and overlapping pathology. Secondary Pathogenetic Factors in SURFACE Tissue DAMAGE also form Sequences of increasing severity that propagate the disease process. Chronic inflammation is the main amplifier of disease - it gives rise to several Vicious Circles and to a Chronic Tissue Remodeling with Loss of Function. The secondary pathogenetic events that occur in SURFACE TISSUE DAMAGE reveal characteristics of pathways of chronic mucosal inflammation. Apparently the primary impact is on the epithelial cells of the cornea and conjunctiva - which is in line with the observation that an insult typically comes from the outside, i.e. the luminal region, i.e. here the tear film - even though pathology can also start in the tissue, as discussed above. Inflammation as such is no major problem in principle because it is a very basic protective answer of tissues to many noxious stimuli that intends to remove the negative stimulus. Inflammation is a regulated process and thereby limited - it typically ends with a regeneration, repair and healing. However, a single vicious circle is misleading - it is half true and half wrong ... such ideas usually cause most problems. Inflammatory processes are typically first innate and subclinical - which means it does not, or very limited, show the typical clinical signs of inflammation such as redness, swelling, heat and pain. Therefore the impression that such signs are absent in patients does not tell there is no inflammation of any degree. At the ocular Surface in Dry Eye Disease unluckily, but typically, two of these problems exist - chronicity and immune-modulation. Auto-immune disease in Dry Eye is presently only shown in a mouse model by NIEDERKORN and colleagues but may also be possible in the human. presentation of auto-antigens from own cells to lymphoid cells in the context of inflammatory danger signals that can lead to auto-immunity. activation of proteases (Matrix-Metalloproteinases, MMPs) that degrade the connective tissue stroma. In a worst case scenario, such chronic ocular surface inflammation can lead to Degenerative Tissue Remodeling with Loss of Function as shown in the mechanistic diagram.